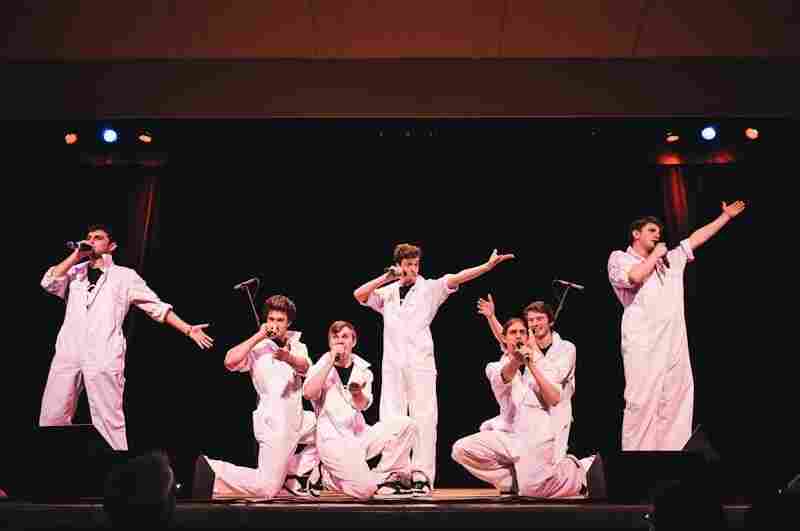 Agony, Ecstasy, Irony: The Fight For The Soul Of College A Cappella At the real-life competition dramatized in Pitch Perfect, approaches to a subculture that's suddenly having its moment vary enormously. The Nor'easters, of Northeastern University, perform at the International Competition of Collegiate A Cappella on Saturday night. 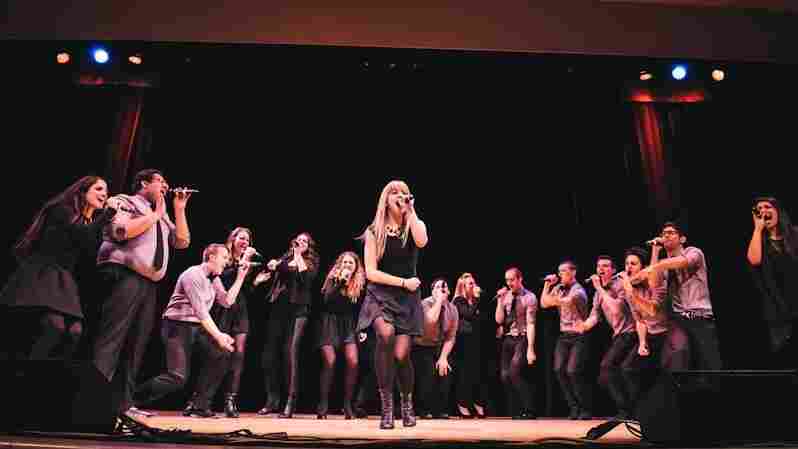 Saturday night at Town Hall in New York, the Nor'easters of Northeastern University in Boston were crowned national champions at the International Competition of Collegiate A Cappella (ICCA), the entirely real battle dramatized in last summer's surprise hit Pitch Perfect. On the same night, the organizers announced from the stage that 19 Entertainment, which produces American Idol, was creating a reality series following the groups through the competition. And NBC has announced that it's bringing back The Sing-Off, its a cappella series that was previously believed to be dead. Thus, the Saturday night competition took place while this style of music is having a bit of a moment, from which its advocates didn't shy away — "This is the real Pitch Perfect," went the on-stage introduction. You should know, though, that there is a big lie surrounding college a cappella. The big lie, perpetrated by the movie — aside from the fact that nobody wears precisely matching sparkly costumes like that — is that college a cappella is dominated by mobs of twee goobers standing around singing cheesy '80s/'90s music with enormous grins on their faces. This is not the case. In fact, after hearing the first seven songs, I turned to the friend who attended the show with me and said, "So at this point, the most upbeat song has been 'Cry Me A River.'" The evening had opened with the runners-up from the previous night's high school competition, a group called Forte from Centreville, Ohio. (The winners: Vocal Rush, from Oakland, also performed.) Forte performed "Blown Away," a Carrie Underwood song about child abuse, death, and a natural disaster. (You can see them perform it here to get an idea, but please, I beg you: never judge the actual quality of a cappella singing by YouTube videos; a cappella particularly needs decent audio quality and mixing for you to have any idea how well constructed it actually is.) So "Blown Away" was very intense. Then, the stage was turned over to the Chordials of Cornell University, who gave us covers of "Plain Gold Ring," most recently made popular by Kimbra (very intense); "Lies" by The Black Keys (very intense); and "Too Close" by Alex Clare, which you might know from various commercials. (Also: very intense.) In all three of their arrangements, one person really and truly suffered and wailed while everyone else sang very sad or angry backing vocals. Next up were the Beltones of Belmont University (an ecumenical Christian university in Nashville), who performed a somber, river-centric set featuring Delta Rae's "Bottom Of The River," the Civil Wars' "Barton Hollow," and a medley of the traditional "Down To The River To Pray" and "Cry Me a River" (the Joe Cocker version of the standard, not the Justin Timberlake one). It was somewhere around here that I began to realize guiltily that if a group of identically dressed women in what appeared to be flight attendant uniforms took the stage to perform "The Sign," I might welcome them for the good cheer alone. "This whole scene has gotten a lot more into sad music since I was in college," I said to my pal. 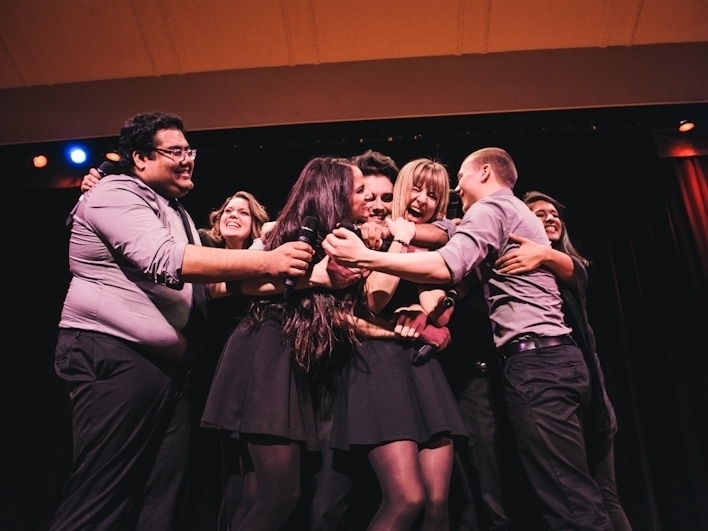 The Northeastern University Nor'easters celebrate after winning at the ICCA finals. And so it went over the evening, with a good number of the performances. "Too Close" popped up again, Kimbra popped up again two more times, there were takes on Frank Ocean and Imagine Dragons, and the Nor'easters themselves closed the show with Florence + The Machine's "Drumming Song," Melanie Fiona's "Wrong Side Of A Love Song," Rihanna's "Diamonds," and Swedish House Mafia's "Don't You Worry Child." It was an excellent set, but ... awfully serious. It's a long way from what you might be envisioning. These are the groups, in effect, that were representing for the notion that, to paraphrase a quote from Glee, there's nothing ironic about a cappella. And in fact, contrary to the perception that a cappella is out of touch, if these groups are guilty of myopia of any sort, it's that they've tossed much of the history of music before the last five or ten years. If anything, they are overly infatuated with the current, not the ancient. Look, there's nobody in college a cappella who doesn't know that it's used on The Office to signify Andy Bernard's awkwardness, for instance, or that it was presented in Pitch Perfect as needing to be invaded by a DJ in order to be made remotely cool. And at times, the finals looked like a defiant statement that This Is Serious And Current Music, Ya Bunch Of Haters, and they made the point pretty effectively. The other way to go is the way of, let's say, Reverb. Reverb is a men's group from Florida State, and they are doing a cappella the way it's been done for a very long time, and certainly the way they were doing it in the early '90s when I was in college: with impeccable musicianship but also a generous wink. That's the way the Beelzeubs do it at Tufts, and the Whiffenpoofs do it at Yale, and frankly the way the Treblemakers do it in Pitch Perfect. It means acting like you're hot stuff and being 49 percent serious, plus or minus two percent, as the Reverb soloist did in the back half of their "This Is How We Do It"/"Bad" mash-up. He's doing his Michael Jackson, which is unrelentingly square, but that's ultimately supposed to bring it all the way back around to being adorable. Don't misunderstand: all these groups are talented; Reverb works hard, and they won an award for their choreography. This isn't about who's good and who's bad; it's about choices and styles. And Reverb's choice — a very traditional one — is to walk a very fine line between cool and anti-cool. And the audience went bonkers for them. Two other men's groups, the G-Men from the University of Michigan and the Sons Of Pitches from the University of Birmingham (representing the "international" part of the competition), bring a little less humor to the table than Reverb, but a lot more than the Cornell and Northeastern sets. That was the sweet spot, for me — the Sons Of Pitches, in particular, were great fun without tipping over into the ingratiating. They opened with Eminem's "Lose Yourself," which you have to admit is pretty audacious for a bunch of British a cappella singers, and also threw in some of "Moves Like Jagger," so they were making the rounds. Their cover of Paul Anka's cover of "Wonderwall" sort of must be seen to be believed. I also found myself strangely charmed by the G-Men's cover of OneRepublic's "Everybody Loves Me," where the soloist took my personal award for the evening in the category of Leaving It All On The Stage, Including Much Of Your Sweat. But again, and say it with me if you know the words: Very intense. You can tell that a cappella is trying to figure out where to take this moment it's having, and the judges wound up placing no value on the crowd-pleasing good humor and upbeat excitability of the groups that got the loudest responses: the top three groups were the Northeastern and Cornell groups, along with a great big ensemble from UCLA called the Scattertones (which did the Frank Ocean cover and also quite clearly takes the position that there is nothing ironic about a cappella). This is a whole genre of performing that's still fighting the perception that it's affably goofy, and at least this year, in this competition, it pushed back hard in favor of a much darker brand of music than it's sometimes embraced in the past. There's part of me that fears that a cappella doesn't play to its strengths when it seems so nervous about being perceived as corny that it entirely eschews fun, and an even bigger part that fears that screaming solos have become too prominent at the expense of ensemble singing. That second problem has perhaps been exacerbated by the constant oversinging in high-profile arenas like American Idol — many of the songs on Saturday night were much more effective as soloist showcases than as ensemble work, which raises the question of whether there's a little too much seeking of Your Big Moment, and not quite enough mega-harmonizing, which is where all of these groups are at their best. It's funny, but the most daring moment of the entire night may have been No Comment, a co-ed group from the University of Illinois, kicking off their set with Whitney Houston's "I Wanna Dance With Somebody," which they played entirely straight. It was the first really happy performance of the whole competition, and at that point, it was welcome. This is what's going to make a TV show about this stuff interesting, I think: everybody is so talented and capable, but they're engaged in a sort of battle to the death to pull this very niche-y subculture either toward half-joking and crowd-pleasing or toward the desire to be taken seriously, and it's not clear at all who's winning.